Features deeper, luxurious reds and a new "photo blue" for improved colour reproduction and reduced graininess. Choose from nine different types of creative filters, including monochrome and sepia, to create your ideal photo composition when printing photos from memory cards. *7 Colour document scan speed is measured with ISO/IEC 29183 Target A. *8 Copy speeds are the average of sFCOT and sESAT, ISO/IEC 29183. *9 1-11 in US, CND, LTN, BRA, TW and HK.? *11 NOT supported for 'Canon Easy-PhotoPrint (Windows RT)'. 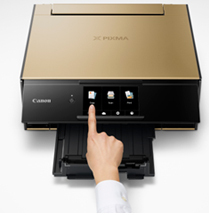 *14 Setting needs to be changed on printer's LCD in order to write or delete any data saved in memory card from the computer, via network is not possible. 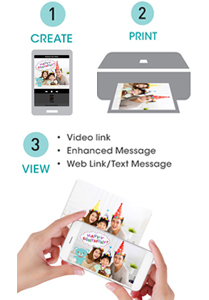 *15 Plain paper is printed bordered automatically, regardless of the camera settings. *16 Not supported for disk label print. *17 Image data taken by DCF (Ver.1.0 / 2.0) - compliant digital cameras, camcorders or camera phones and recorded in JPEG (Exif-compliant) format. *18 Function depends on the connected digital cameras, camcorders or camera phones. *19 Only 'high' mode available as for the printer without LCD. *20 Only 'high' mode available in choosing sticker print. *21 Not supported for 2 / 4 / 9 / 16-up in sticker printing as well as date / file number printing in disc label printing. For '4-up' print layout, either file number or date can be printed at one time. 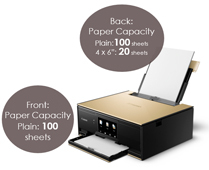 *22 The performance of the printer may be reduced under certain temperature and humidity conditions. *23 For temperature and humidity conditions of papers such as photo paper, refer to the paper's packaging or the supplied instructions. *24 When printing ISO / JIS-SCID N2 on 4 x 6" Photo Paper Plus Glossy II using default settings. *25 Acoustic Noise is measured based on ISO7779 standard. *26 Copy: When copying ISO / JIS-SCID N2 (printed by inkjet printer) on A4 size plain paper using default settings. *27 Can be used by attaching the adapter that is sold separately in the market.